Investors are breathing a sigh of relief after Italy reportedly bowed to European Union pressure and lowered its budget target.What’s going on? To say it’s been a tumultuous few days in the eurozone’s third-largest economy would be somewhat of an understatement. It all started last week, when Italy submitted its spending plans to the EU. The budget came as a shock: The country said it planned to spend a whopping 2.4% more than it makes over the next three years. This target risked breaching EU rules. Investors balked, sending the country’s bonds higher and the euro tumbling. At one point, the crisis was so acute that some were starting to suggest that Italy could be the next Greece. “We have to do everything to avoid a new Greece – this time an Italy – crisis,” was the damning assessment of European Commission’s president, Jean-Claude Juncker, earlier this week. After some bumpy back-and-forth, the country is reportedly backing off and cutting its budget-deficit target for 2021 to 2%. Markets have seen this before; government turmoil has jolted the country twice in just over two years. These charts show what a long, strange trip it’s been. 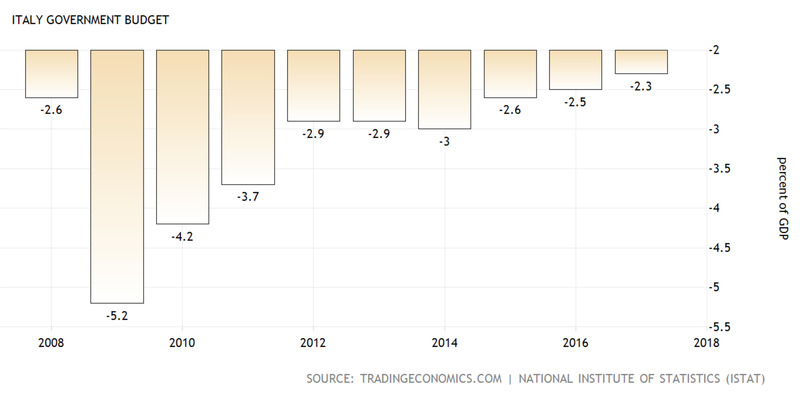 Italy has run a budget deficit consistently over the past 20 years, and although it has shrunk since the financial crisis, it remains at more than 2% of gross domestic product. The country’s new populist government wants to substantially increase the country’s spending on infrastructure projects and social welfare programs. There was pushback from Italy’s finance minister, but the populists won the day, at least at first. 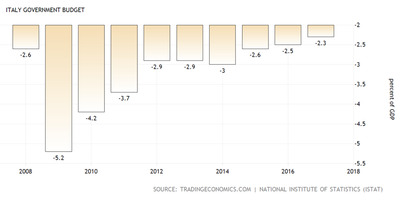 Italy’s 2.4% number was higher than expected, and its spending risked falling foul of the European Union’s rules on spending and borrowing. Worth noting: Any punishment from Brussels would most likely stoke further anti-EU sentiment from both of the eurosceptic governing parties. Perhaps the clearest indicator of the rising fear about Italy is the yield on the country’s benchmark 10-year government bond. Yields reflect the surety with which investors think they will get their money back, and they tend to move in tandem with the stability of a country’s economic and political situation. Government debt from big economies like the US and Japan usually have rock-bottom yields, under the assumption that they will never default. Italian bond yields have jumped more than 20% in just over a week, rising to almost 3.5%, their highest level since 2014. On Tuesday, the spread between yields on the Italian 10-year bond and that of the Greek 10-year was its lowest since 2009, during the depths of the financial crisis. Greece is largely seen as the least secure economy in the eurozone, and the fact that this gap is now so narrow is a troubling indicator for Italy. What’s going on the Italian bond market is made even clearer when looking at a chart displaying the spread – the gap in yield – between Italy’s 10-year bond and the 10-year German bund. On Tuesday, that gap climbed above 3 percentage points, with Germany’s 10-year trading at a roughly 0.4% yield. 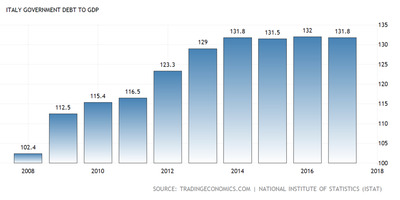 Germany’s government debt is widely seen as being one of the safest investment vehicles on the planet, thanks to the country’s staunch commitment to running a budget surplus. Italy, on the other hand, is looking increasingly unsafe to investors, sending bond yields soaring. Who cares about rising yields, anyway? A high debt level is not in and of itself a problem, but it can become so if borrowing costs rise. Government debt as a percentage of GDP is also sky-high in Italy, with only Lebanon, Greece, and Japan holding higher ratios of debt to GDP. This increases the amount it costs to service any debts and can lead to major financing issues down the line. The coalition government has said it ultimately aims to lower Italy’s debt ratio – but not for a little while, so don’t discount a short-term increase in national debt. 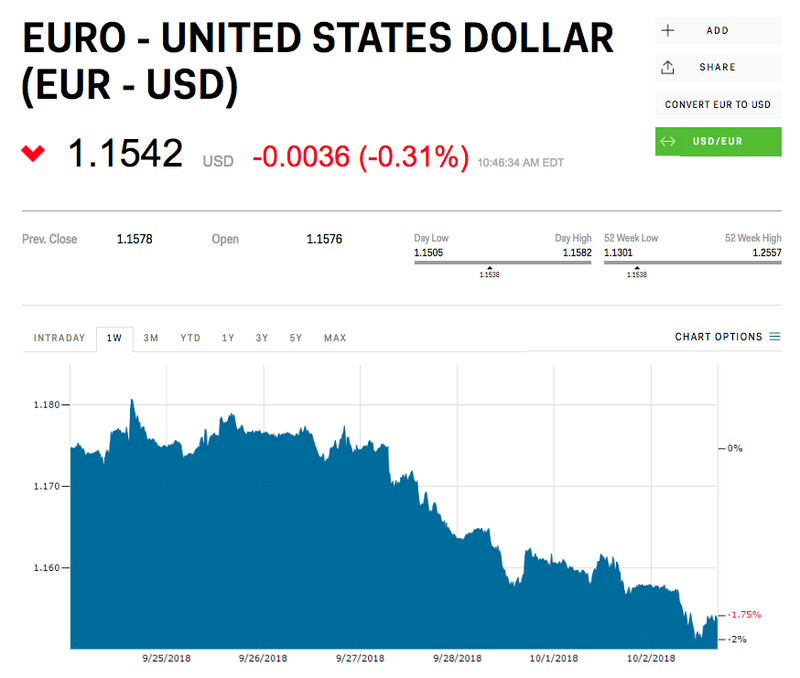 The euro is a handy proxy for political risk in European countries that use the currency – it generally falls when talk of political trouble arises. It fell about 2% against the dollar over the last week. Italy is crucial to the European project, so negative developments around its politics are rarely a good thing for the single currency. There’s an extra layer to the problem bugging investors, too – an apparent willingness among senior Italian politicians to pull Italy out of the euro completely. The government has backed off those comments, but the concerns are there. If Italy managed to leave the euro, it could spell serious trouble for the rest of the eurozone. Alongside Italy’s sky-high government debt, another cause of worry around the country’s finances is its banking sector.After a full-blown crisis almost emerged in 2016, Italy has managed to iron out some of the worst of the financial sector’s problems. But debt levels remain high, and most banks have a large proportion of toxic loans – that they don’t expect customers will ultimately pay back – on their books. So whenever Italy’s economy starts to look shaky, bank stocks tend to suffer. “Despite improvements over the past few years, the banking sector is still too weak to withstand the impact of much higher bond yields for long,” Capital Economics warned in a note on Wednesday. That was evident Friday when some Italian banking shares lost more than 10% of their value. The chart above shows the Italian banking share index, which aggregates the performance of Italy’s major lenders. It has dropped more than 11% since the start of last week.